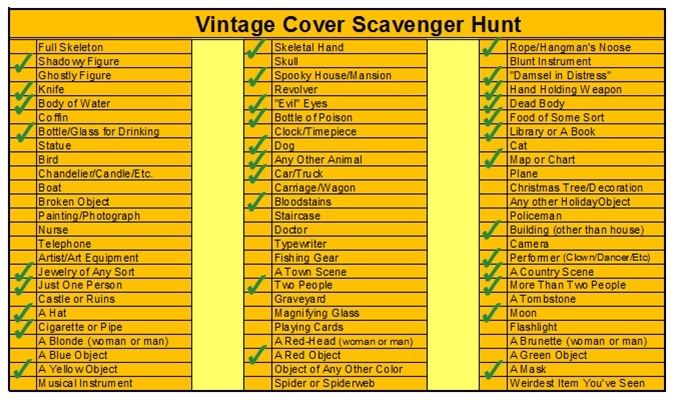 So, the halfway point of the year saw me in possession of a paltry 16 out of 75 on the Vintage Mystery Cover Scavenger Hunt set by Bev over at My Reader’s Block. So where does the three-quarter point of the year find me? If I don’t get enough of these then I’ll never be allowed into the Crime Fiction Consigliere Club, that peculiarly merciless cabal of bloodthirsty maniacs…but, well, I’ve already said too much, so they’re unlikely to let me in now anyway. 32, baby! Which, yes, isn’t even halfway yet, but at this rate of increase in progress I’ll…hang on, wait a minute…carry the one…ah, dammit, I’m still not going to do it. I should probably provide links to the posts to prove that I have actually collected these items, but if you don’t trust me not to cheat on this then what are you doing here? Any doubters, makes your requests in the comments and I’ll provide the appropriate link — how’s that? The remainder of my reading year shall have to be taken tantivy if I’m to complete this, and that’s unlikely, but you never know. Well, let’s lace up my readin’ shoes and get a move on — vamoose! Ha, well if I give the impression that I’ve thrown myself full-bloodedly into this challenge then I must be coming across very poorly indeed! Yay! Well Done JJ. Having completed two of Bev’s challenges in the past it definitely takes a lot of organising, in fact I’m fairly sure Bev actually has spread sheets to keep track of all the books she needs to complete challenges. Currently being driven slightly mad by the fact I can’t find a cover with a coffin on! You’d think considering the chosen genre it would be an easy one to find, but alas not. Two that spring to mind are Margery Allingham’s More Work for the Undertaker, and the Penguin eidtion of Carr’s It Walks by Night (which has shoes protruding from the end of a coffin, but it’s still a coffin). Shall keep an eye out for any more…! I finished both the gold AND silver challenges in mid-May. Were we supposed to tell somebody about this . . . .???? Anyway, I’ve just ordered a stack of JDC novels. 😀 Excluded buying the one you’re about to review, as I’m waiting to hear what you have to say. JJ: I am (very belatedly) working my way through old posts…You’re doing grand (there are A LOT of items on my scavenger hunt lists this year). I’m just pleased that you play along with me! It’s a lot of fun, Bev, even though I’m doing poorly — thanks for setting it up, and count me in for 2017!